"Home is where my 'art' is: Soft edges and brilliant colors are why I paint with soft pastels. If I had to choose between the process of painting and the end product, I would choose the process every time." I begin my paintings with a strong contrast of highlight and shadow and build a simple composition that creates interesting shapes for pastels. Planning colors is more than an intuitive process for me, it's based on the principles of art and years of experimentation. When it's time to paint, I make myself very small and go into the scene, always questioning... "How do I feel about the light? Do the temperatures of the cast shadows and the direction of light create a line of travel through my forms?" Finally, when I can see my spirit in the work, I know I'm finished. In my early years at The University of Arizona, I drew what's unseen behind the human figure with a mesquite twig and sorted out colors into endless families of values. In my 13 years of working as a fine artist in soft pastel, I have received over 40 awards from juried shows and have had seven one-woman shows. 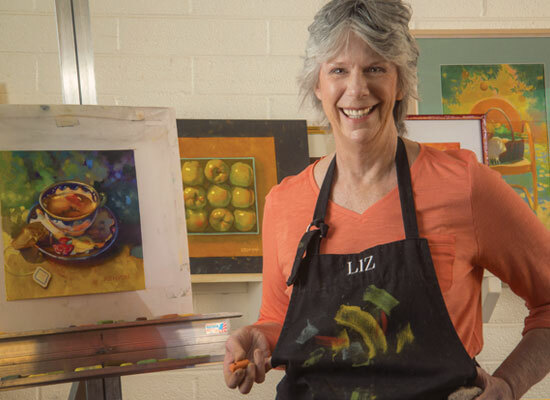 Continuing to teach workshops on pastel painting at Scottsdale Artist School and numerous venues in Arizona, New York and Florida keeps me in touch with fresh viewpoints. I am a signature member of the International Pastel Society and active in the Arizona Pastel Art Association. My work is highlighted in four books: Best of Worldwide Artists, Pastel, Volume I, Best of Pastel America, Volume II, Finding Your Visual Voice, and Pure Color: Best of Pastel Edition and numerous publications, including: Fine Art Collectors of America, Emerging Artists, 2009 as well as several web site collections. I grew up in a small rural town called Watsonville in California. The instructors at the University of Arizona encouraged me with their insights on drawing and color. Since then, I have done everything from working in design studios to owning my own ad agency, publishing firm, and illustration business. Among my national clients were Post Cereals, Disney Studios, and Motorola. I also illustrated book covers for Harper Collins in New York for fifteen years, and when I wasn't illustrating, I learned to paint with soft pastels. I am now exclusively a Fine Art, Soft Pastel Painter. I currently teach at Scottsdale Artist School.